The Nett Warrior programme used the NIE 12.1 in November to test new concepts in preparation for an RFP in the New Year. The Nett Warrior team is currently implementing changes based on the CSB and the impact of the use of lighter technologies from an engineering perspective. The schedule adopted prior to the new configuration for Nett Warrior remains in place. Major Copeland stated, “We are seeking a production decision in the 2Q FY12. Between now and then we are taking some of the newest, latest technology available and inserting it into the Army’s Agile [Procurement] process. We want to get the capabilities out there to the user faster in the future. If you are going to field something which with the old model had a five to seven year cycle, you are not able to keep up with the rapid advances in technology; this new process gets new capability to the Soldiers in twelve to eighteen months. The PEO will continue to use these and other sources of data from the NIE as well as the Joint Tactical Radio System PRC-154 Initial Operational Test and Evaluation to move forward. 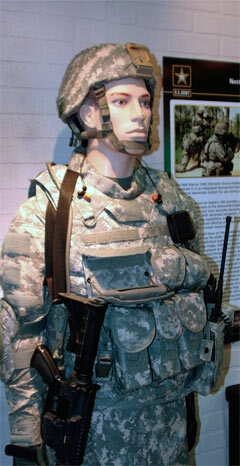 Major Copeland explained, “We use those sources for data mining to generate enough information and data so that senior leadership can make the right decisions to inform the production decision in 2QFY12.” The Army plans to field thirty Brigades with Nett Warrior capabilities. The process of stopping work on the contracts for all three contractors on Nett Warrior under the previous strategy (General Dynamics C4 Systems, Raytheon and Rockwell Collins) is near completion. The equipment used at NIE was a mixture of Government Furnished Equipment and Commercial Off the Shelf solutions integrated by the Government. “We have taken all the learning from Nett Warrior and Land Warrior to date but what we are doing now is a completely different look. We have put together some end user devices for NIE, using an Android operating system, coupled with the PRC-154 and some tablet alternatives. The solution set on the software side of the house is actually government software.” The use of cellular networks in Nett Warrior was also explored at parallel events to the NIE, the Army Expeditionary Warrior Experiment (AEWE), at Fort Benning, GA and the Joint User Interoperability Communications Exercise (JUICE) at Fort Bliss, TX.